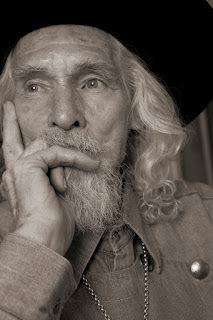 Day before yesterday I saw Instagram and Facebook posts from Reid Callanan the owner of the Santa Fe Workshops, one of the premiere photography workshop operations in the country. In his entries Callanan writes about Donald Blake who has modelled at the Workshops for almost twenty years. To celebrate that milestone, the school has just published a book of his portraits. I had the privilege of photographing Donald during an extraordinary portrait lighting class with Alan Thornton ten years ago this summer. Didn't see mine in the book though. In his commentary Callanan extols Donald’s grasp of the portrait making craft, allowing that he has “offered more insights and advice than many of our instructors.” I can attest to it. While I was taking his portrait, he was suggesting where to place the softboxes, what angle would be best, even the f-stop. And he was right on all counts. Donald was recovering from a serious illness at the time. Don't recall the malady. Though he appeared frail he was 100% engaged and very much in command. We were shooting in a recently shuttered hospital so we were awash in ghoulish props. As a matter of fact, he was sitting in a wheelchair between institutional green walls when this was taken. The setting was ironic given his condition. During his nearly twenty year modelling stint at the Workshops Donald’s portrait has been taken by hundreds of photographers. They include students like me and famous ones like Joe McNally who has called Donald Blake his favorite model, period. McNally’s photographs are predictably the first two in the new book. He, like Reid Callanan, calls Donald a friend, first, then a model. That’s as much a testament to the man as the book. The title is “Donald.” It’s available from blurb.com. This is an excellent portrait of the Model's Model - Donald Blake - and should have been in the book, Steve. But it is yours (and now ours, luckily) in perpetuity.. It could be featured in your own publication of portraits, Steve! Kudos.